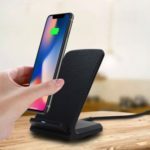 This 3-in-1 10W Fast Wireless Charger is specially designed for Qi-enabled devices, such as iPhone X, 8, 8 Plus, Samsung S8, S8 Plus, Galaxy S7, S7 Edge, etc. 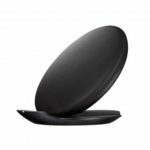 With input of 5V/2A or 9V/1.67A, 2X faster than normal wireless charger. 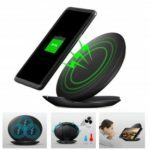 Combined wireless charging and wire charging, this product supplies additional USB connector for charging output. You can also use it as a reading lamp or night light. 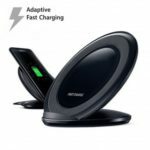 With the input of 5V/2A or 9V/1.67A, this charger is 2X faster than normal wireless charger. No plug or wire needed, your smartphone can be charged fast, save you from long waiting time and tangling cables. Larger inductive area, making charging more stable without blind spot, enables you to charge your phone vertically or horizontally. Comes with a USB desk lamp, great for reading, working, and studying. 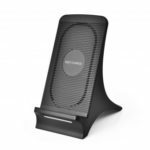 With an additional USB port on the back, support to charge ordinary USB device.